Are you in the market for cat ear headphones, but with the amount of options in the marketplace you aren’t sure what to buy? In this buyer’s guide you’ll find 7 of the top cat ear headphones that are worth taking a look at. This buyer’s guide will save you time since there is no need to research the best options for yourself. We have included a buying consideration section below to simplify the buying process for those that have never bought cat ear headphones. Here we go over the important features such as audio quality, wireless connectivity, durability, brand, and comfort. It’s worth taking each of these factors into account so that you’re able to end up with the headphones that best match your requirements. Cat ear headphones started back in 2014 when an anime artist named Wenqing Yan was developing an anime that had cat ear headphones. This become trendy in the real world and the style caught on worldwide. They are a fashion statement and can be used when shooting videos for YouTube to add a nice touch that will impress your subscribers. Comfortable ergonomics and wireless connectivity. The colors of its design can be changed to match the mood. It has the seal of approval from Ariana Grande. Volume limiting: kid ears cannot handle loud noises the same way adults can, which means their headphones need to be capped at an upper limit. Headphones without volume limiting elements should be avoided when buying for kids. The volume should be limited to 85 decibels such as with the LOBKIN Foldable Headphones. Comfort: kids are only going to wear the headphones on a regular basis if they are comfortable. So make sure to inspect the amount of soft padding, and an on-ear fit is preferred as the bulk is significantly lower. Wireless connectivity: the restrictions of a wire for kids can be a deal breaker for regular use. Kids are active and therefore need headphones that allow them to move without restrictions. Therefore, make sure the headphones are Bluetooth compatible and you’ll find them in this buyer’s guide. Visuals: kids want their headphones to look visually pleasing so they look good in front of their friends. Therefore, it’s a good idea to ask your child about what color options suit them best. In this buyer’s guide you’ll notice headphones that have a rich variety of colors to make a selection from. Frequency response: the human ear can hear in the range of 20-20,000Hz, so the headphones should have this range at minimum. However, a wider range is desirable as it indicates that the headphones have strong bass and great highs. We have added the frequency response of all headphones to each fact box for your convenience. Bass: if you like bass boosted music then this attribute is worth paying attention to. In the product description the brand will give special mention to bass if they have made an effort to give it a strong implementation. Noise isolation: ambient noise is one of the biggest culprits to enjoy a personal audio solution the way it was intended. For example, if you live next to a busy road then the cars going past can be a constant distraction to your personal audio experience. If that’s the case then invest in headphones that have strong noise isolation. 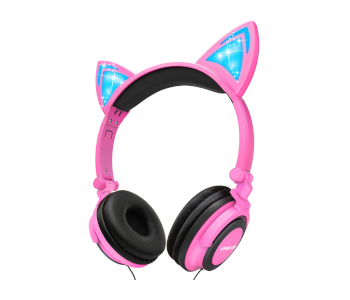 The overall durability of the headphones in the cat ear niche is not great overall. Therefore, you’ll need to keep a close eye on the materials that are implemented to determine what you can expect. Make use of the high resolution images to get a feel for the design and read through the buyer comments. If there are any glaring durability problems then you’ll no doubt uncover them via this research method. Furthermore, take a close peek at the warranty information to determine how much faith the manufacturer has in their headphones. Pay attention to the damage types that are covered and the length of the warranty deal. Battery life: if you are the type of user that hates recharging batteries then make sure to look for headphones with extended battery life. Some headphones allow you to switch to wired mode when you have run out of battery life, which ensures you never have to go without a personal audio solution. Bluetooth version: take note of the Bluetooth version to determine the range and audio quality that can be excepted. Bluetooth 4x is implemented in the headphones here, which means the range is around 33 feet. Quick charge: some headphones have a quick charge features that enables the user to receive a boost in battery life for a small period of charging time. this is handy when you have unexpectedly run out of battery life and urgently want to use the headphones. The brands in this buyer’s guide are not popular personal audio companies that you’re familiar with. Therefore, it makes sense to do some background research on the brand you interested to buy from. You can uncover vital information such as the type of customer service they offer and the overall durability of their products. Furthermore, take a look at customer reviews of their product range. This will give you the key insights that are needed to decide if a brand is worth buying from. It’s a good sign when a brand consistently releases headphones that are highly rated. Headband: the padding under the headband should be extensive so that you’re able to enjoy a soft touch on the head. It must also be adjustable so that you’re able to match your head size. 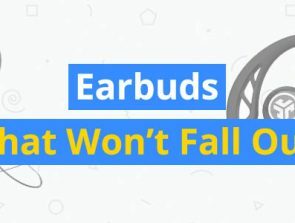 Earcups: the majority of headphones in this buyer’s guide have soft earcups that are pleasant to wear for long durations. The materials used must also be breathable so that heat and sweat is dissipated into the surroundings. Weight: we have added the weight of all headphones in the fact boxes. Use this information to determine how cumbersome the wearing experience will be. Heavy headphones that have a bulky design should be avoided when possible. Wireless connectivity: headphones with Bluetooth compatibility improve the comfort since you don’t have to deal with wires. The comfort is also improved if the wireless connection can be extended over a long distance. 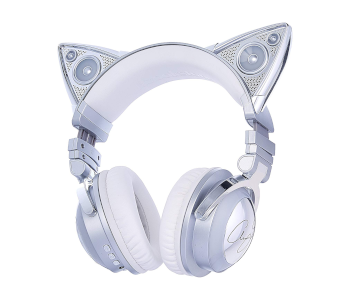 Are you on a tight budget and are looking for highly rated cat ear headphones? Then you’ll love the execution of the competitive offerings in this category. The headphones here look cute and provide the functionality that makes them versatile. 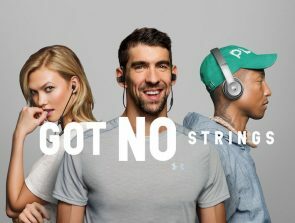 They all have a microphone that can be used to take calls without taking off the headphones. Furthermore, you’ll love the choice of colors and LED lights that brings these headphones to life. There are a lot of similarities between the headphones in this price bracket so take the time to carefully consider the differences. 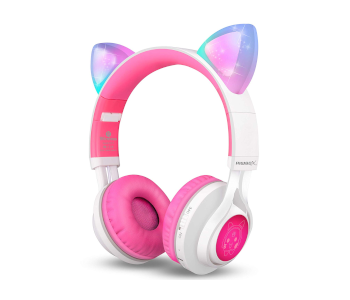 The Minkdoo cat ear headphones are one of the more popular on the marketplace with excellent reviews from buyers. The value for money is off the charts and a bunch of good design features means you’ll love what’s on offer here. The predominately black design ensures they have a somewhat neutral look that can be enjoyed by most buyers. There are fancy LED glowing lights on the earcups and eartips that add a lot of style to the look. The black design means that these LED lights stand out – especially when the lights are turned off. However, the LED lights consume extra battery power so you’ll need to keep that in mind when turning them on/off. The adjustable headband has a soft and ergonomic design that provides a snug fit. Once you adjust the headband it will lock into place. Furthermore, the earcups have plenty of soft padding that allows for a nice feel on the ears. Therefore, you can wear these for prolonged periods of time without feeling the need to take a break. The brand provides a 24 month warranty deal that covers many damage types and they claim to be available to answer emails around the clock. This level of customer service should give the confidence to make an investment. These are Bluetooth headphones so you don’t have the hassle of dealing with wires. This is ideal for kids that want to use these while outdoors without having to be restricted by a wire. Also there is a built in microphone that can be used to answer calls. Therefore, when buying these for kids you can call them to stay in touch. The drawbacks of these headphones compared to others in the marketplace is the lack of LED light options. Blue is the only color available, whereas with other headphones you have a choice of 4+ colors. To conclude, the MindKoo Wireless are a good choice for buyers that want to add a touch of style to their headphones. 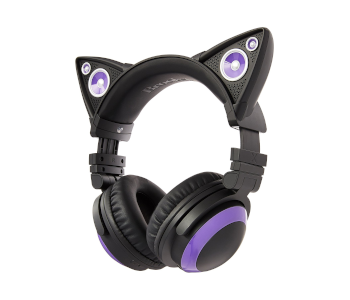 The cat ear design is trendy and the portability of these headphones adds to the overall appeal. These are one of the best rated car eat headphones in the marketplace and they are a great choice of kids. The brand has carefully considered the target user and crafted a pair of headphones that is practical and represents good value for money. Read through the features that are offered here to determine if your kid will love to use these on a daily basis. You get a choice of two main color styles which is pink and blue. The visual design can be described as adorable and your kid will instantly fall in love with them. The lightweight design means they are comfortable to wear for kids so they won’t be putting them down out of discomfort. The ergonomic design is based on extensive testing that adds value to the purchase. The volume limiting features is a great addition here that gives you peace of mind. It ensures that your kids will not damage their ears regardless of what volume setting they have selected. The maximum volume level is 85 decibels, which is safe to enjoy for prolonged periods of time. These are wired headphones, which means your kids will not have the comfort of a wireless design. However, the cable that’s offered here is durable so kids can pull on the wire without it easily tearing. The framework of the headphones is also durable, which means you can bend and let it drop without fear for damage. The combination of the soft earcups and padding on the underside of the headband means you’ll love the ergonomic fit. Your kids will enjoy wearing these regularly since the feeling is pleasant on the skin. To summarize, the iClever Kids Headphones is a great choice for kids that are after cool looking headphones that have decent sound quality. Lack of a wireless design might be a drawback for some, but the durable cable ensures battery management is not required. The value for money here is excellent and they are highly rated so the purchase is a no-brainer for the budget buyer. The Riwbox CT-7 cat ear headphones provide exceptional value for money that you’ll struggle to find elsewhere in the marketplace. The combination of the ergonomic comfort, visual design, and decent audio quality means the brand has given these a lot of attention. Take a close look at the features implemented and you might be impressed enough to pull the trigger on a purchase. The white and pink appearance means these headphones are primarily designed for girls. It’s an attractive design that does not have the feel of low cost regardless of the dirt cheap price. You also get to choose from two styles that allows you to somewhat personalize the look. The large 40mm audio drivers means each note has good impact and the Bluetooth 4.2 connectivity ensures that audio quality is not compromised as it travels through the air. You’ll experience almost no audio hiccups that tend to ruin the experience. A smartphone app can be used to let you know the battery life and connection status. These headphones offer strong bass that allows you to enjoy music genres like rock, dance, and club. 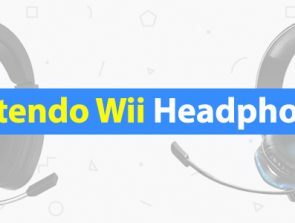 However, given the low price you cannot expect these headphones to compete with more expensive options such as the ones offered by Brookstone. You can also switch between wired and wireless mode to mix up the listening experience to your preferences. For example, if you are sitting down on the couch and don’t want to waste your battery life, then the wired mode makes sense. The braided audio able ensures there is decent durability and it doesn’t get tangled easily. Before coming to a decision about these headphones consider a few of the drawbacks that could potentially be a deal breaker. Firstly, the durability is somewhat questionable if you intend to use these on a daily basis. The biggest users are going to be kids that can be heavy handed with headphones, so the durability could be improved. Also the adjustability of the headband could be better so that it locks into place. To summarize, the Riwbox CT-7 headphones are a great choice for the budget buyer that wants a cool looking design, wireless connectivity, a microphone, and low pricing. They would be the ideal gift for little girls that are in need of a personal audio solution. 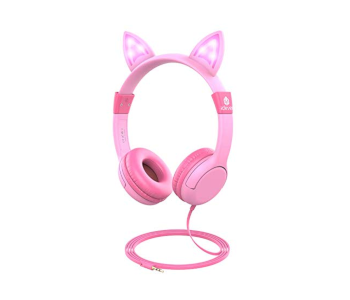 This is another budget pair of cat ear headphones that are suitable for kids. The low price means you are not risking much and makes it ideal to give as a present for young kids. They look visually attractive and the array of features means there is an element of practicality here. Read up on the features implemented to get a better overview of what’s on offer. They come in a choice of colors, but many of the color options have a pink theme. The on-ear design is perfect for kids because the headphones will not be cumbersome to wear. The low weight and minimalist profile ensures kids can remain mobile while enjoying music. However, the lack of wireless connectivity means kids need to worry about the placement of the wire. The mixture of the cushion earpads and soft padding on the underside of the headband means kids will be comfortable. Also the headband is replaceable, which is great for when it wears out and you don’t want to invest in a completely new pair of headphones. It’s also a foldable design that allows the headphones to be reduced down in size. This is convenient for when you’re traveling and need to store the headphones into a tighter space. The noise reduction technology means that you don’t have to concentrate on the ambient sounds as much as with comparable headphones. Some ambient noises are eliminated to ensure audio clarity is maintained. A kids-safe volume limiting feature is added that doesn’t allow the audio to exceed 85 decibels. This is excellent because you can have the peace of mind that your child is not going to damage their ears due to excessive audio levels. To conclude, the LOBKIN Foldable Headphones are a great choice for those on a budget that want the combination of a cat ear design, child friendly features, and decent audio. No industry leading features are added here, but small touches like the noise reduction technology means there is a lot of value at such a low price. Buyers that want cat ear headphones with extra performance and attention to detail should look at the models in this price bracket. LED lighting allows these headphones to look cool – especially in the dark. You’ll also love implementation of the microphone and wireless connectivity that offers added practicality. However, you need to pay attention to the lack of durability. Handle these headphones with care so that longevity is not a problem. It would be frustrating if you had to invest in a new pair of headphones shortly after purchase. The visual style of these headphones is trendy and mostly has a grey design. They are highly popular in this niche since they are the Ariana Grande edition, which also raises the price to the premium bracket. 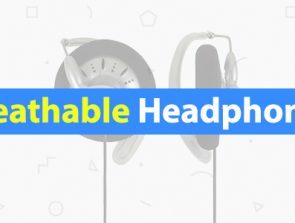 The headphone features implemented here are solid, but you’ll need to check them out for yourself to see if they justify the price. This is a wireless pair of headphones that is able to recharge via USB, which means you can charge them from portable devices such as a laptop. However, the battery life is only 5 hours long, which is not competitive in the headphones marketplace. You’ll need to take care of constant battery maintenance to avoid running out of battery power when you need it most. Bluetooth is implemented here so compatibility with the majority of wireless devices is not a problem. The wireless nature of the design means you have freedom of movement and won’t be restricted by the length of a wire. The color of these headphones can be changed to match your mood. The color options include light blue, green, orange, ice, lavender, pink, hot pink, and purple. The high degree of customization means you’ll never get bored of the visual style. The over-ear design of these headphones provides a comfortable fit due to the large and soft earcups. This design also contributes to noise isolation so that ambient audio is reduced. This means audio clarity within the earcups is not sacrificed when in a noisy environment. The 40mm audio drivers are not the largest out there and the frequency response of 20-20,000Hz is average in the headphone marketplace. You also get a microphone that has a frequency response rating of 200Hz–18KHz with 32mm audio drivers. This is also average and you can expect decent audio quality. Therefore, communicating with family and friends online will be pleasant. Before adding these headphones to the shopping cart consider a few of the drawbacks. Firstly, the design is not very durable so you’ll need to be careful not to drop them. Also the short battery life could be improved so that constant battery maintenance is not required. To conclude, the Brookstone Limited Edition Ariana Grande headphones are a great choice for the user that want style, wireless connectivity, and decent audio quality. They are a pricey pair of headphones, but are highly rated so you can trust the value is there. These headphones are for buyers that enjoy a number of color themes and want external speakers to share their audio experience with others. They have a unique design as most other headphones manufacturers are not bold enough to implement external speakers. Delve deeper into the features offered here to figure out if the value matches your requirements. These headphones are suitable for gamers that want a bit of style to their overall look. A detachable mic is included that can be used to turn these headphones into a gaming headset. Voice is important for gaming since it gives the ability to communicate with others in the online environment. The frequency response of the mic is 200-18,000Hz and the audio drivers are 40mm – about average for the headphones marketplace. The LED lights can be controlled to alter the visuals and the choice of colors includes purple, blue, green, and red. Otherwise the headphones are completely black, which allows the colors to stand out even more – especially in a dark environment where the lighting is minimal. You can enjoy a wired or wireless setup with these headphones, but the battery only lasts for 5 hours. Therefore, you’ll need to constantly monitor the battery life to ensure you do not run out during the listening session. The battery can be recharged via USB, which is handy as nowadays it’s easier to find a USB port than a free power outlet. Brookstone does a good job of implementing comfort and that’s evident here. The large soft earcups go around the ears to provide a seal that promotes noise isolation. Also the headband has plenty of soft padding on the underside. Therefore, you can wear these headphones for hours without feeling like there is a need to take a break. You also need to consider a few of the drawbacks before adding these headphones to the shopping basket. The durability is the first issue since the use of materials is questionable to ensure longevity. Also the battery life could be increased from 5 hours since this is not competitive in the headphone marketplace. Overall, these cat ear headphones are great for buyers that require external speakers to share their personal audio solution with others. You’ll also love the choice of colors, detachable microphone, and competitive price. These are highly rated with a lot of praise from buyers, which means they are worth taking a closer look at. The pink and cream design doesn’t stand out too much and the use of materials means decent durability can be expected here. 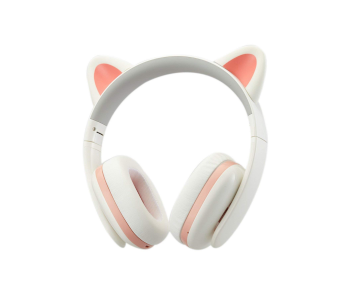 They are not among the cheapest cat ear headphones, but the value that’s offered here means they could be the ones you’re looking for. They are compatible with 99% of Bluetooth devices on the market and have version 4.0 implemented. This enables the user to be a maximum of 33 feet away from the audio emitting device without a loss of audio quality. The included microphone means you can take calls hands-free without the need to touch your smartphone. This is a handy feature when you’re driving or walking down the street. You receive a foam moulded carrying case that allows the headphones to be kept safe while traveling. It adds value to the purchase and extends the longevity of the headphones. That’s because the majority of headphone damage occurs while they are being stored during transit. The cat ears of these headphones cater to the younger audience that want a bit of personality to their personal audio solution. Therefore, these headphones are great for kids and teenage girls that want something which allows them to stand out from the crowd. The 40mm audio drivers have a good implementation allowing for impactful music. The frequency range is an average 20-20,000Hz and there is a 3.5mm connection for when the battery has run out. Therefore, you can continue to enjoy music for the entire day. The IPX4 rating of these headphones ensures you can use these while working out. This rating means they can take light splashes of water without damage to the audio drivers. Therefore, damage from sweat or light rain is not a problem. This added layer of durability ensures that you can go for longer without having to invest in a brand new pair of headphones. The drawbacks of these headphones is the lack of bass that might be a deal breaker for users that enjoy impactful music. Also the visual appearance of the cat ear design might not be as attractive as other models. However, this last point is all about personal taste. 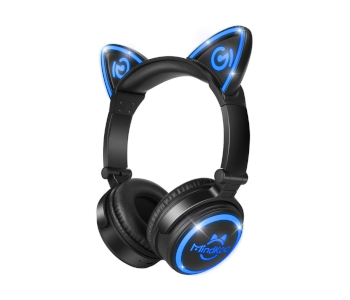 In conclusion, the Censi Cat Ear Headphones is a great choice for audio enthusiasts that want a bit of style to the visuals. The combination of the wireless connectivity, comfortable ergonomics, and competitive price means you’re getting a lot for the investment.